ATLAS MARIDAN ApS. of Rungsted Kyst (Denmark), a subsidiary of the German naval systems supplier ATLAS ELEKTRONIK, has launched an autonomous underwater vehicle (AUV) rental service. The opportunity to rent ATLAS ELEKTRONIK’s latest unmanned underwater technology shall support customers within the offshore oil and gas, renewable energy, UxO and naval markets. 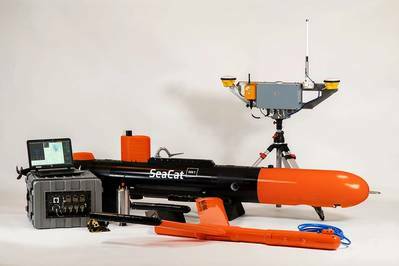 The AUV SeaCat has recently finalized its serial maturity process and concluded certifications covering a wide range of requirements for system robustness, environmental conditions, navigational accuracy and transport safety. SeaCat is designed to enhance the user’s agility in meeting high demands for a multitude of offshore surveys. Capable of providing high-level performance and survey accuracy, SeaCat is an efficient, low infrastructure vehicle that can be operated from any platform, according to the manufacturer. SeaCat is equipped to collect high resolution sonar data geo-referenced by a survey grade positioning system. A highly accurate Doppler Velocity Log aided Inertial Navigation System (iXBlue) is able to fulfill navigational accuracy standards up to IHO S44 special order and can be additionally supported by a GAPS transponder system. Rated to 600 meters and with an endurance of up to 20 hours at 3 knots, SeaCat is suitable for a wide range of operations. Adaptation to user requirements can be conducted in the field, with an exchangeable head section allowing for the customer’s choice of task related sensor suite. The available payload added to the rental pool will be SeaCat’s “Survey Head FOUR”, hosting a wideband multi-beam echosounder (NORBIT) a camera and light source, a sub-bottom profiler (TRITECH) and a connecting port for a special developed neutrally buoyant towed magnetometer system based on Sensys 3-axis Fluxgate technology. 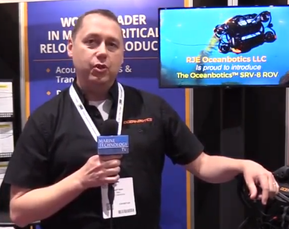 An EDGETECH side-scan sonar 2205 DF will be installed on the vehicle and delivered as standard. The necessary shipset will be included in the rental scope and additional equipment added to the rental pool, i.e. launch and recovery systems, fiber-optic cables and remote units for remotely controlled operations, acoustic positioning sensors as well as spare parts and maintenance tool suites. The AUV SeaCat is now available to rent directly through ATLAS MARIDAN ApS.